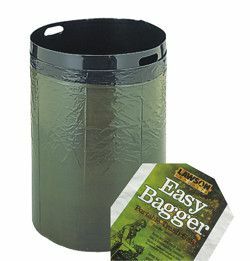 The Easy Bagger is a sturdy, reusable plastic liner that slips inside plastic lawn and leaf bags. When installed, the tension applied to the bag holds it open and make it easy to load. No more holding the bag open as you try to dump grass clippings from your lawnmower. Since the Easy Bagger acts as a liner for your trash bag, pointy branches can be pushed into the plastic bag without worry of ripping the bag. No more double bagging to prevent cuts in the bag, the Easy Bagger has you covered! With the liner in place, you can also compress the yard waste inside the bag. The plastic sides allow you to push down and condense the contents, resulting in a bag that holds more than you ever thought possible! Once the bag has reached its capacity, grab the handles in the liner and pull straight up and the Easy Bagger will be removed – its that simple. Not only does the Easy Bagger save you time, it will save you money!